Not to be confused with odeon (disambiguation) or odium (disambiguation). Odiham (/ˈoʊdiəm/ or /ˈoʊdʒəm/) is a small historic town and civil parish in the Hart district of Hampshire, England. It is twinned with Sourdeval in the Manche Department of France. The current population is 4,406. The parish has an area of 7,354 acres with 50 acres covered with water. The nearest railway station is at Hook, on the London and South Western Railway. The town had its own hundred in the nineteenth century, named The Hundred of Odiham. 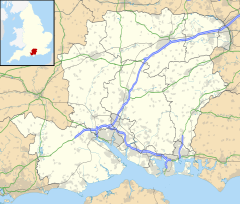 The town is situated slightly south of the M3 motorway and approximately midway between the north Hampshire towns of Fleet and Basingstoke, some 41 miles (66 km) southwest of London. RAF Odiham, home of the Royal Air Force's Chinook heavy lift helicopter fleet, lies to the south of the town. The first written record of Odiham's existence is in the Domesday Book (1086), where it appears with its current spelling, although the spellings Odiam and Wudiham have sometimes been used since. 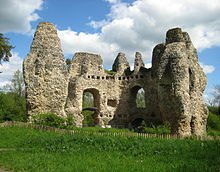 King John decided in 1204 to build Odiham Castle and it was built during the years 1207 to 1214 at a cost of over £1000. He already had some ninety strongholds all over the country, and he may have chosen Odiham because it is halfway between Windsor and Winchester. In 1216 the French Dauphin Louis VIII besieged King John in the castle for two weeks. King Henry III, son of King John, gave the castle to his sister Eleanor in 1236, so when she married Simon de Montfort in 1238 the castle became the de Montfort family home. However, Simon was killed in the Battle of Evesham in 1265 when he led the rebellious barons to fight against the king; Eleanor was sent into exile. During the fourteenth century the castle played a role in several significant events, including a sitting of Parliament, and the imprisonment of King David II of Scotland in the castle for eleven years. However, by the fifteenth century its only use was as a hunting lodge. The castle was described in 1605 as a ruin, which it remains to this day. The Pest house was built c. 1622 and subsequently housed local people and travellers suffering from the plague and other infectious diseases. Many such "isolation hospitals" were built in that period but the Odiham Pest House is one of only five examples surviving. It was restored by the Odiham Society in 1981 to form a mini Heritage Centre. Pest is the old word for plague and like other Pest Houses built in England, it was subsequently used to house local inhabitants or travellers suffering from the plague, smallpox and other infectious diseases. Odiam or Odiham, a small Market-Town, where was formerly a strong Castle and a Royal Palace. The Castle was straitly besieged, Anno 1216, the 18th of King John, by Lewis the Dauphin of France, and the Barons Army, for fifteen Days together, being maintained by thirteen Men only in it for all that Time. King Henry III gave it with Killingworth Castle, to Simon Earl of Leicester, who repaired them both, and then resigned them into the King's Hands. David II of Scotland was kept prisoner here in Edward III of England's Days. This Place is famous for giving Birth to Mr. William Lily, who wrote the Grammar; which, with some Alterations, is commanded by Act of Parliament in King Henry VIII's Reign, to be taught in all Schools. He died master of St. Paul's School, London, Anno 1522. On 16 May 1783, a group drawn from 'Gentlemen of Rank, fortune and Ingenuity' plus some 'intelligent farmers' met in The George Inn, Odiham to inaugurate the Odiham Agricultural Society as a 'society for the encouraging of Agricultural and Industry in their town and neighbourhood'. Influenced by key members like Thomas Burgess and Granville Penn, the Society also resolved to reform farriery and animal care by establishing a school to teach veterinary science in England. This was to result in a far-reaching outcome: the foundation of the Royal Veterinary Society and the birth of the veterinary profession in Britain. Robert May's School was founded in 1694. The Basingstoke Canal, which passes Odiham. ^ "Civil Parish population 2011". Neighbourhood Statististics. Office for National Statistics. Retrieved 31 December 2011. ^ The Parliamentary gazetteer of England and Wales, Volume 2. Fullerton & co. 1851. p. 197. ^ Hampshire County Council (2006). "Odiham Castle". Countryside Service. Retrieved 9 June 2006. ^ Cox, Thomas (1738). Magna Britannia, Antiqua et Nova. London. Wikimedia Commons has media related to Odiham. Martin and Jean Norgate (2001). "Odiham". Old Hampshire Gazetteer. Retrieved 21 May 2006. This page was last edited on 18 December 2018, at 13:12 (UTC).